The APT Step Ring Gasket is an improved gasket design which has been used in MONDI™ piping since 1985. It has provided excellent service for many acid producers. Acid piping systems are subject to thermal cycling through years of operation. It is important to use the proper gasket. 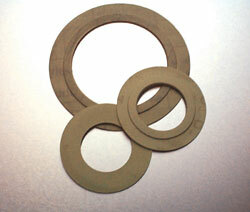 APT Step Ring Gaskets are made of Fawn Gylon. Fawn Gylon has excellent resistance to sulfuric acid, mechanical strength and recovery properties that maintain the seal with thermal cycling. Excellent recovery eliminates the need for bolt retightening. Fawn Gylon will not cold flow into the pipe ID or outside the flange OD like other materials. This gasket consists of a 1/16″ thick standard ring section plus a 1/16″ thick inner ring section. Both sections are bonded together. The standard ring section is for locating and centering within the bolt circle. The inner ring section is for sealing. Total thickness at the inside diameter is 1/8″ (3mm) in the critical sealing area. There is a limit to bolt loading for each size flange. For the Step Ring Gasket, compression is concentrated over the smaller area of the inner ring, allowing the grooves in the flange face to bite into the gasket. This provides a tight seal with proper torquing of the bolts. This gasket works on the same principle as a raised face flange. The Step Ring Gasket’s superior seal prevents acid migration from inside the pipe and corrosion of the flange face which shortens the life of piping systems.